HALIFAX, NOVA SCOTIA–(Marketwire – Oct. 2, 2012) – Erdene Resource Development Corp. (“Erdene” or “Company”) (TSX:ERD), today announced that it will hold a special meeting of shareholders (“Meeting”) on October 26, 2012 to approve a plan of arrangement (“Arrangement”) to separate its Mongolian metals exploration projects, which will stay within Erdene, from its North American projects (consisting primarily of its 25% interest in the Donkin Coal Project), which will become the major asset of Morien Resources Corp. (“Morien”), to be listed on the TSX Venture Exchange. Upon completion of the Arrangement, Erdene shareholders will control 100% of the Mongolia assets through Erdene and 97.25% of Morien. “We believe the proposed division of our diverse key assets within the two public vehicles will greatly enhance the potential to create value in both the Mongolian metals projects and in the Donkin Coal Project and we are excited to launch these two focussed entities. 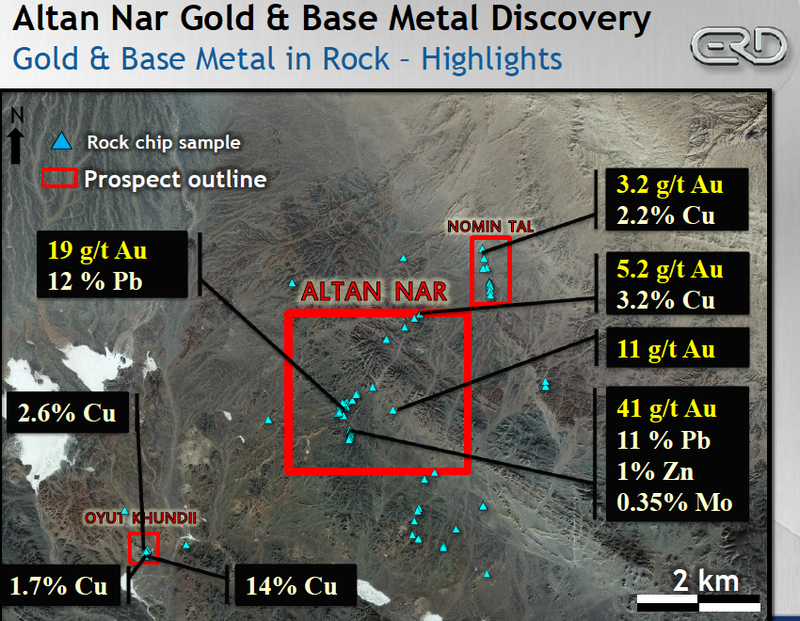 We are confident the flexibility we will create within Morien with its interest in what we believe to be a premier global coal asset and the dedication we can commit to the Altan Nar gold project and our other Mongolian metals exploration projects, will prove to be very beneficial to our stakeholders” said Peter Akerley, President and CEO of Erdene. The management information circular (“Circular”) outlining the details of the proposed transaction has been filed on SEDAR. It is also available on the Company’s website (www.erdene.com) and is being mailed to Erdene shareholders. The Meeting will be held at 10:30 a.m. (Atlantic Time), at Purdy’s Wharf Tower II, 1969 Upper Water Street, Suite 1300, Halifax, Nova Scotia. At the Meeting, shareholders will be asked to approve the Arrangement, which involves the transfer by Erdene to Advanced Primary Minerals Corp. (“APM”) of $1.95 million cash and all of Erdene’s North American property interests, comprised primarily of its 25% interest in the Donkin Coal Project in Cape Breton, Nova Scotia, by way of the transfer of the shares of Erdene Resources Inc. (“ERI”), a wholly owned subsidiary of Erdene, to APM. As part of the Arrangement, following the transfer, ERI and APM will amalgamate to form an amalgamated corporation to be named “Morien Resources Corp.” (“Morien”). The shares of Morien will be consolidated and Erdene will create a new class of shares (“Erdene New Shares”). On the effective date of the Arrangement (“Effective Date”), Erdene will distribute to Erdene shareholders one-half of one Erdene New Share and one-half of one Morien share in exchange for each outstanding Erdene share. As an example, a holder of 1,000 Erdene shares on the effective date will become a holder of 500 Erdene New Shares and 500 Morien shares. (a) all of Erdene’s North American property interests, consisting primarily of Erdene’s 25% interest in the Donkin Coal Project, will be held by Morien, which will trade on the TSX-V under the symbol “MOX”. Morien will have an aggregate of 49,255,990 shares outstanding, 97.25% of which will be held by Erdene shareholders and 2.75% will be held by the former shareholders of APM other than Erdene. (b) Erdene will continue under the same name and trading symbol and will continue to focus on precious and base metal exploration in Mongolia. It is anticipated that Erdene will have 47,901,450 shares outstanding. A shareholder’s current percentage ownership of Erdene will remain unchanged after the Arrangement. To be effective, the Arrangement must be approved by (i) at least 66 2/3% of the votes cast by Erdene shareholders present in person or represented by proxy at the Meeting, and (ii) a majority of the votes cast by Erdene shareholders other than the senior officers and directors of each of Erdene and APM. The Arrangement is also subject to the satisfaction of other conditions, including the approval of the Nova Scotia Supreme Court (“Court”). Assuming the necessary shareholder approval is obtained, Erdene intends to seek the Court’s approval on November 1, 2012. If the Court order is obtained and all other conditions are satisfied, it is expected that the Effective Date will be on or about November 7, 2012. Upon completion of the Arrangement, a news release will be issued by Erdene advising of the actual Effective Date. The record date for determining the Erdene shareholders entitled to participate in the Arrangement will be the Effective Date. Erdene’s board and management believe that the Arrangement will enhance the ability of each of the two companies to pursue their independent corporate objectives and strategies, with a view to maximizing long-term shareholder value. In particular, the Arrangement will allow Erdene to focus on advancing its metals projects in Mongolia, led by the significant new gold discovery at Altan Nar, and will allow Morien to focus on the development of bulk commodity projects in North America, primarily coal projects, led by the Donkin Coal Project. Further, transferring the Donkin Coal Project into a separate public vehicle will provide current Erdene shareholders with additional investment flexibility, as they will hold a direct interest in two separate public companies, each focussed on their distinct objectives and each of which should be valued by the market based on the various factors unique to each business. The Arrangement is also expected to improve the market’s identification and recognition of value for both the Donkin Coal Project and Erdene’s metal projects in Mongolia. Full details of the proposed Arrangement and detailed information regarding Morien are contained in the Circular. Erdene Resource Development Corp. is a diversified resource company with metal and coal interests in Mongolia, as well as the Donkin Coal Project and industrial mineral assets in North America. Erdene has 95,802,901 common shares issued and outstanding and a fully diluted position of 100,555,901 common shares. Certain information regarding Erdene and Morien contained herein may constitute forward-looking statements within the meaning of applicable securities laws. Forward-looking statements may include estimates, plans, expectations, opinions, forecasts, projections, guidance or other statements that are not statements of fact. Although Erdene believes that the expectations reflected in such forward-looking statements are reasonable, it can give no assurance that such expectations will prove to have been correct. Erdene cautions that actual performance will be affected by a number of factors, most of which are beyond its control, and that future events and results may vary substantially from what Erdene currently foresees. Factors that could cause actual results to differ materially from those in forward-looking statements are described in the Circular and include market prices, exploitation and exploration results, continued availability of capital and financing and general economic, market or business conditions. The forward-looking statements are expressly qualified in their entirety by this cautionary statement. The information contained herein is stated as of the current date and subject to change after that date. Erdene assumes no obligation to revise or update these forward-looking statements or to revise them to reflect the occurrence of future unanticipated events, except as may be required under applicable securities laws.